​​​​​CELINA - Hillwood Development plans to build a 1,250-home master-planned community north of Dallas on land that had been in the same family since before the Civil War. 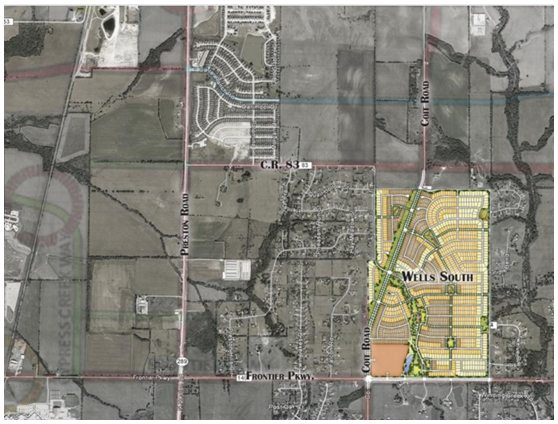 The 400 acres in Celina, at the northeast corner of Coit Road and Frontier Parkway near Preston Road, were purchased from the Wells family, Hillwood said in a statement. The total investment in the development, along the Preston Rd. corridor, will be about $400 million, the company said. While home sales in parts of Texas have been affected by the decline in oil prices, demand in and around Dallas remains strong. The median home price in the Dallas area was $226,100 last month, up 13 percent from a year earlier, with the number of properties changing hands rising 4.4 percent, according to the Real Estate Center at Texas A&M University. Hillwood is likely to break ground on the Celina project in January, with the first homes planned for completion in early 2017. Houses are expected to sell for $300,000 to $500,000 each, the company said. The master-planned community will also include resort-style amenities, multiple community parks, miles of trails and retail and restaurant space. Prosper ISD is the school district for the acreage. ​Also se​e the Dallas Business Journal.